The more railway tunnels I pass through, the more I understand why Dame Agatha wrote Murder on the Orient Express. Consider caves, at least of the domesticated sort: when you enter a cave, the tour guide invariably takes a moment, amidst great ceremony and many warnings about not panicking, to turn out the lights. On a train––in the U.K., say––when you go into a tunnel, the train’s lights remain on, so you can still read your trashy celebrity gossip rag or look your renegade child in the eye. But in Serbia? Well. On Serbian trains, there are no lights, so when your particular coach ducks beneath a hill, you enter, with no warning, a world of perfect blackness topped off with roaring, windy noise. Sometimes you stay there for only a moment or two, but if you are unlucky, you can be marooned in this nether state for five minutes or longer. This morning, our train plunged into a tunnel at the exact moment that my two-year-old and I stepped out of the highly suspect and possibly haunted W.C. If Evan replied, I couldn’t hear him. Nor did I know what he was supposed to hold. But, one minute later, the train rediscovered daylight, and we trotted back to our compartment none the worse for wear. Even so, I must admit that I always experience a nagging sensation when immersed in total darkness, a sort of mental itch that asks, “What if the light never comes back? What then?” I had a flashlight, yes, but that was half a carriage away and deep inside a heavy backpack, buried by strangers’ luggage. How to get at it? Other thoughts also intrude in the darkness of tunnels. Thoughts like, “Where the hell is that restaurant car the brochure promised?” This is the Balkan Express, after all; surely it ought to have at least one amenity? Primitive it may be, but the lumbering Balkan Express is definitely more interactive than Western Europe’s slicker and more hermetic counterparts. You can’t open a train’s windows in Britain and France, so you can’t––for example––see the signals, and if you can’t see those, you have no idea why the train has slowed, stopped, or sped up. On the Balkan Express, you can lean your head right out the window as often as you like. And, if you actually do try this as often as you like, your head will be clipped clean from your shoulders by trees, vines, passing signal posts, oncoming diesels, or the next available tunnel entrance. The Balkan Express definitely made clear to me just how much pesticide the U.S. uses on its track systems. Weedy tracks in the U.S. signal dereliction, disuse. In rural Serbia, even the express lines were weed-covered. True, this made every length of track look like a siding, but the ground water must be substantially healthier. The window views told one story clearly: Serbia is impoverished. Some villages seemed to be getting along well enough, but others were at the level of the Navajo reservations, those gut-wrenching stretches along the highway between Flagstaff and Albuquerque. Strangely, even on buildings where the inhabitants had no windows and precious few doors, it was easy to spot satellite dishes. They sprouted from walls and rooflines like wealthier flowers blown in by random, western winds. To say they looked out of place is entirely insufficient. Other sights included a ten-year-old boy waving at the train as he drove his father’s ox-cart, with oxen attached, while his father looked on nearby. Five minutes farther up the track, we passed a woman traversing a long muddy trail, one that paralleled the rail line. There was no sign of pavement for a kilometer or more in either direction, but on her feet, she wore a pair of six-inch platform shoes, banana yellow. She was making good time, too. Shortly after that, a cow wandered up to within a few feet of the train. There was no fencing to prevent it from lumbering right onto the track. Beyond its attendant meadow stood a field of flame-red poppies. Do some of the locals farm opium on the side? Somewhere around Leskovac, the Serbian police did search the train for something, but they didn’t find any of whatever it was they were after––at least not in our compartment. They gave us only a cursory check, and I’m sure we looked essentially harmless: a family of four comprised of myself (a writer), my wife, Diane (a professor of theater), and our two sons, Evan and Corey, aged two and six, respectively. Around lunch time, I spotted a stork, sitting on a pile of gravel outside one of Southern Serbia’s many cement plants. It did not have a baby bundled in its sword-like beak, but it might well have been looking for a nest. The storks in the Netherlands look for trees, but here large trees seem to be entirely absent, even high up along the most imposing hillsides. Heavy logging? Possibly, but the countryside is not densely populated. Possibly maple-sized trees never grew here? The houses cannot be to blame. They are uniformly built of various earthen, ceramic materials. Wood is barely involved. Someplace past the stork, we met Dorde. (To pronounce his name accurately, name the state of Georgia, then tack an S to the end: Georgias.) He looked to be around forty, and turned out to be an engineer. He struck up a conversation when he realized we were speaking English. Next thing I knew, he informed me was from Nis (“Neesh”), our somewhat random destination du jour. Oh, and did we not have reservations? Did we really have no idea where to go? Not to worry, Dorde assured me. He would recommend a good place. Meanwhile, the train had plunged not into another tunnel but into a truly memorable thunderstorm. The rain was torrential: whistling sheets of cats and crashing buckets of dogs. We now fully expected to get completely drenched in the course of finding a hotel. In fact, we expected to be drenched simply by stepping off the train. But luck was with us. The station was covered, and Dorde got off with us and told us to wait. He arranged for a taxi. He paid for the taxi! And he told the driver where to take us: the Hotel Alexandor. As we waved good-bye, he explained that the Hotel Alexandor was where his British friends once stayed, and that we would be well taken care of. Snappy jokes aside, I started to wonder if this cabby was perhaps taking us to a Kosovo-style excavation pit where we would be summarily shot. We were climbing a very steep escarpment and appeared to be leaving the city behind. There were certainly no businesses, no mini-marts, and hardly any streets that deserved the name. But then––suddenly, you know, because these things are always sudden––we arrived at the top of a foothill that was part of a much larger mountain up behind, and there stood a luxury hotel. It turned out to be one of the cheapest hotels we found in our entire ten weeks of travel, but it was not in any way cheap. Our proffered credit card got us an attentive English-speaking staff, extra bottled water, two bedrooms, eighty-three channels of all-European everything, plus a thing in the bathroom that I really couldn’t identify, but it plugged in and looked cool and it bore a sticker with bright red print reading “220 volts.” I mean, honestly, what else can tired, out-of-their-element travelers ask for beyond high-voltage mysteries in otherwise perfect bathrooms? Perhaps best of all, to my weary mind, was the UEFA Cup, Europe’s Super Bowl of club soccer, scheduled to broadcast at 8:30 pm that night, in English. Liverpool vs. A.C. Milan. Of course, to get at the game, I first had to pry my wife from the world table-tennis championships, live from Zagreb. As the match got underway, we attempted to call Dorde. Failing that, we tried email. We hoped he could join us for breakfast, since kindness of his order surely deserved to be repaid. Unfortunately, he did not respond until three days later when we were all but out of the country, and we never saw him again. Nis, a mid-size city, is an industrial and manufacturing center with a university that specializes in mechanical engineering. The overall effect is helter-skelter, and ultimately unfinished. The most common make of automobile is the Yugo, but a number of others jostled for position, including Opel, Zastava, Citroen, Pugeot, and Renault. What appear to be Soviet-era rattletrap rustbuckets also have their place. Yes, there’s the occasional luxury brand (an Audi, perhaps), but mostly Serbian cars are driven into the ground and appear lucky to start in the morning. Buildings are Third World in their tendency to cluster finished next to half-finished, rich next to poor. Not a stone’s throw from our superior hotel stood a house where the occupants must enter via an unrailed, unpainted concrete stair, and anyone wishing to reach the storage area under the roof––all open to the air, no doors or even walls––must climb a rickety ladder made of storybook sticks. The woman who swept the terrace, like the street cleaning crews in Skopje, used a broom made of lashed-together twigs, frizzy and witchlike. A homeowner just down the street from the Hotel Alexandor had emplaced a sort of animal pen in their front yard, a cage made of moldering scrap planking and wire; it ran from the front door nearly to the street, but had neither entrance nor exit. It would have fit, roughly, a hippo. Odd cages aside, this was clearly a land where winter and cold must be taken seriously. In no other city have I seen such remarkable quantities of stacked firewood. Sniping and posters announced upcoming shows for the Scorpions, and metal-band Saxon showed up a month back. “DJ’s from Brooklyn” (so said the poster) had a date coming right up. More than once, people we met declared with evident pride that they were among the first municipalities to denounce Slobodan Milosevic, and when they discovered we were from the States, they immediately asked if we’d been to “the fortress.” Initially, we had not, but we soon rectified our error. As fortresses go, it was not especially impressive (although the gatehouse area was both mighty and mighty well preserved). One reason we made the effort at all is that we were promised “a lot of playgrounds.” We found two, although really neither qualified: the play ship had long since lost its quarterdeck, half the poop deck, and all the supports for the crow’s nest, while the second play area relied entirely on plastic Chicco toys, very appropriate for almost-three-year-old Evan, not so much for almost-seven Corey. On the plus side, Corey had the unlikely experience of being mobbed like a rock star once a gaggle of slightly older kids invaded and discovered he spoke English. In no time, Corey was literally surrounded, and a couple of the kids ran off to get their adult supervisor, who turned out to be their English teacher. We exchanged email addresses and added a new pen-pal to our burgeoning list. 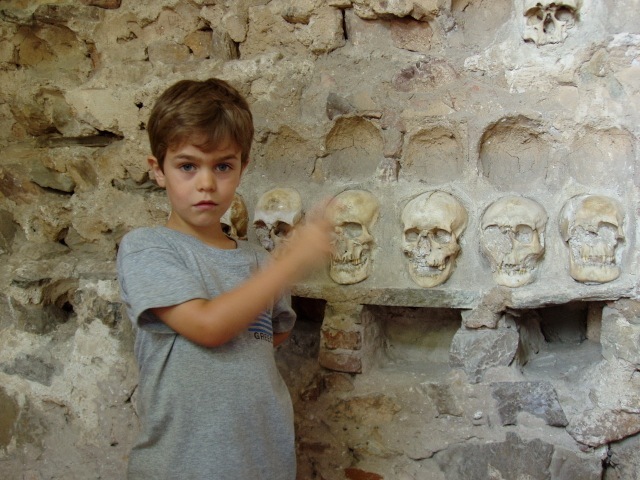 The other place all Nis-ians told us to go was the Cela Kula, the Skull Tower. We got there the morning after the UEFA Cup (A.C. Milan 2, Liverpool 1) at the insistence of Sinis (“Shinish”), the hotel’s voluble, patriotic waiter. To hear Sinis explain the world, all of Serbia’s recent troubles were due to the European Union. He insisted that the EU was punishing Serbia, unjustly, for the Bosnian and Kosovo conflicts. In 1991, explained Sinis, Nis was a manufacturing hub. People had jobs, the factories were open. His parents earned the equivalent of 200,000 Deutschmarks a year, and they vacationed all over Europe. Now they were earning a subsistence living with no hope of a vacation. Throughout his history lesson, Sinis never once mentioned Milosevic by name or hinted in any way at Serbia’s potential complicity in its own fate. The summary of Sinis’s complaints might be read as, “We’re being stepped on by outsiders, it’s not our fault, and the solution is to take refuge in our indissoluble national identity.” Gene Roddenberry (among others) would have been horrified. Sinis couldn’t travel any more than his parents. Serbians faced significant travel restrictions, and in this regard, Sinis was correct to “blame” the EU. Decisions about who could exit Serbia depended on a quota system, and the waiting lists were long. Even if one happened to “win” the travel lottery, paperwork and visas were deliberately expensive. To hear Sinis tell this tale, it all did begin to sound rather punitive, but even if the sanctions had been lifted that very afternoon, Sinis and his fellow would-be vacationers would still have had to contend with a staggeringly unfavorable exchange rate. My family of four ate for practically nothing while in Serbia. My entire dinner, centered on a large (excellent) turkey on Panini, cost a dollar. Why? Because one dollar bought sixty-one Serbian dinars. My sandwich cost seventy. A single Euro, much dearer than the dollar, would have bought me two sandwiches, at least. The pain on Sinis’s cheerful face as he related all this was comic partly because he was done up in a waiter’s formal black-and-white outfit, bow tie and all, and partly because what pained him most was the downfall of Serbia’s glorious Red Ultras, the Beograd soccer club that in 1991 actually won the UEFA cup. They’ve never been close since. Without the money to attract top players, Serbia found itself with a league and a top-flight team that weren’t worth owning; they command fandom now mostly via long rambles down memory lane. Back to the Cela Kula. In 1809, in “the first Serbian uprising,” the local powers sent an over-matched army up against their controlling overlords, the Ottoman Turks. The Serbs dug a trench, stuffed in four thousand men, and refused to surrender. When they were about to be over-run, they committed mass suicide by detonating their munitions supplies. The Turkish general, furious, ordered the dead Serbs beheaded and scalped, and then he had the skulls stuffed with cotton. This grisly task done, the Turks built a mound-like tower of mortar and Serbian skulls. It stands to this day, four long blocks from downtown Nis. Actually, much of the tower crumbled years ago, but the Serbian government finally commissioned a memorial church to be built around the remaining twenty feet of the tower, and the fallen skulls lay buried beneath. Upon opening the door to the church, a row of still-mortared skulls leered out from within. A few were clearly missing, but if anything, this made the Cela Kula even more ghoulish and sobering. Equally sobering were the final words of the explanatory signage: “Another testament to Serbian courage and Turkish barbarism.” With smiling Sinis in the lead and his sentiments set to a military cadence, I could just imagine Serbia parading once again into a personalized, useless war. The pervading mood must have owed a great deal to drink. In Nis, when you wanted to quaff a beer away from a bar, you purchased it in two-liter plastic bottles, just like soda. Based on what I saw in the trash cans, this was the rule, not the exception. Forget the piddly little twelve-ounce can; when in Serbia, you can really toss it back, in massive 7-11 style gulps. Also in keeping with the national mien, “Knockin’ on Heaven’s Door” was clearly a big hit in the Balkan hinterlands. We heard one version in Skopje, another the next night in Nis. Go figure. On our way out of town, and not far from the Cela Kula, our taxi passed a Roma shantytown. It looked like a rain-soaked film clip of Soweto, South Africa, with an enormous trash pile out front, and children sorting through it like ants on an anthill. The next day’s train rolled us north to Beograd (yes, spelling aside, you still say Belgrade). Corey’s favorite train activity in those days was to listen to stories on the iPod, but he was not allowed to do that until he’d worked through his schoolbooks: Handwriting, English, and Math. It was on that leg of the journey that we made flash cards for the first time. Corey moaned and complained––up until Diane started him actually using the cards, and then he really got into it. I found the experience deeply satisfying to watch, and I would have been more directly involved had Evan not taken his daily nap stretched across my leg, with his hot little head pressed into my thigh. This position rendered me entirely immobile. When he woke, my pants revealed a big round sweat-mark, together with plenty of drool. That day’s trip was supposed to take just under four hours, but the train arrived thirty-five minutes late and proceeded to fall farther and farther back as it bumped along. This was certainly not the fabled Balkan Express. It wasn’t any kind of express. This was the Serbian Get-There-Eventually Choo-Choo, and it all seemed fine until I took to reading (as a pass-the-time-activity) the Eurail brochure, glossy and cheerful, describing how “a porter will help you with your bags.” Great Scott, what utter nonsense. Nobody helped with anything, and the last time anyone cleaned these trains (especially the bankrupt toilets), Serbia could still beat the U.K. in football. ––or, by inference, what they were doing. The principal difference between Nis and Beograd turned out to be that, in Beograd, it stopped raining. Also, everybody in Beograd owned a cell phone, some of them pretty chic. Even so, nobody had an iPod (except us). It must also be noted that the citizens of Beograd wore decidedly Western clothes. (My wife, after looking over Nis’s many shops––and we had lots of time while waiting for yet another drenching, torrential thunderstorm to pass––said, “It’s like T.J. Maxx. Everywhere.” But smaller, I thought. Mini-Maxx.) What galled me most was the essential trashiness of what we, the U.S., have managed to make trendy. I spotted one shirt that read, in English, “Serbian Gigolo: First Night Free.” And what to make of the teen girl strutting around in a t-shirt reading, “Try me”? She did not appear to be acting like a prostitute in any other respect. If I had only two English words in my arsenal, I’d choose “Hello” and “Thank you.” In fact, I’d choose those two in any language, worldwide. But, I can also see the charm of getting along with “Toasted” and, by way of Italian, “Prosciutto.” I guess. Overall, Beograd struck us as a city of uncertain identity. The Hotel Moscow still proudly glared at a square now dominated by brand names like Canon and McDonald’s, and the ghost of Soviet Yugoslavia loomed in the soot-stained, shoebox architecture. Nevertheless, you could shop in Timberland and spend a hundred dollars on basic street shoes just as we do in the States. Only food and taxis were cheap. I still don’t understand how that works; if food pricing isn’t commensurate, how do people in the food industry survive? For better or for worse, our journey north required that we spend only one night in Beograd (we were aiming for Poland and a meeting with one of the fabled Shannon Five, the protestors who decried Ireland’s involvement with the Iraq war by taking pickaxes to a U.S. Navy F-16). So the following morning found us again at the rail station, primed and ready for our next train. But oh, what a train. We rediscovered the definition of sweat. Have I ever in my life become so soaked and shiny without first running hard or perhaps falling into a very deep river? No more private compartments. No more seats on the toilets. No real separation between the smoking and non-smoking halves of each coach. Windows too fogged to see through, and only the top eighth would open. No A/C, of course. Definitely no restaurant car. In place of that, we had a boxcar attached at the back (quite possibly full of Yugos and cotton-stuffed skulls). Our four-hour timetable filled out to nearly five. We “enjoyed” long, baking stops at stations forgotten both by repairmen and modernity, each crumbling depot looking more decrepit than the last. Our fellow travelers, mostly Serbian, also seemed listless and unhappy, but despite the heat (both inside and out), the farther north we moved, the more smiles we saw and the less kitschy the clothes. Finally, having survived the Train from Dante’s Inferno––with two boys who were unbelievably well-behaved––we found ourselves in a lost corner of Serbian Paradise, Subotica. (“Shoe-BOT-i-cha”). A nice small city, walkable and easy, with bike paths marked by yellow brick, like Oz. A gorgeous shady park just outside the café-lined train station. Men in (gasp) shorts. Women in (double gasp) short skirts. A bit of a hike to the available hotel, true, but only because the nearby and recommended joint had been booked solid by––get this––an International Children’s Theatre Festival. We had been planning to throw the boys into a bath and bed, but having discovered the festival, we adjourned to the the city center, an elaborate series of plazas acting as public hosts to various theatrical events. On the largest stage, we found Polish dancing set to amplified accordion. People in traditional and culturally specific costumes meandered in all directions. Happy locals gawked while sitting around the multiple public fountains, and the various cafes seemed to be doing their level best to outdo one another with cheap and delicious food. Off in one corner, a wedding party of enormous size flowed as one into a building I can only describe as a turreted, filigreed palace. We felt, there in Subotica, as if we’d arrived in a different country. The Serbia of Sinis and skull towers seemed infinitely far away, paved over with good will and cheerful diversions. The people appeared almost unrelated––blonder, more Germanic, less downtrodden––and a good many of the buildings looked unbelievably different. What, then, made this part of Serbia Serbian? A border? A line on a map invisible from space––or, for that matter, anywhere? Mark Rigney is the author of numerous plays, including Acts of God (Playscripts, Inc.) and Bears, winner of the 2012 Panowski Playwriting Competition, as well as the non-fiction book Deaf Side Story: Deaf Sharks, Hearing Jets and a Classic American Musical (Gallaudet University Press). His short fiction appears in The Best of the Bellevue Literary Review, Black Gate, Witness, and Black Static, among many others. Two novellas are pending from Samhaim Publishing, and two collections of his stories are available through Amazon, Flights of Fantasy, andReality Checks. His website is www.markrigney.net.